In the big hard region known as Appalachia, routinely maligned or mythologized as some single vision backwater in the American Dream, a long line of acclaimed poets has regularly astonished a national readership by drawing on the rich cultural treasury and diverse bevy of voices that transcend any map or media images. Nonetheless, it takes a dazzling new chapbook of poetry, every now and then, to remind us that the extraordinary fountain of Appalachian letters continues to churn out some of the most original, innovative and downright fearless voices today. Crystal Good's debut collection of poetry, Valley Girl, marks the entry of such an astonishing new voice into the national poetry circuit. Capturing the conflicts and ambitions of a generation seemingly adrift and deeply rooted at the same time, Good unflinchingly casts her poetic spell on the "quantum phases" of "things that matter" in her native West Virginia, from mountaintop removal mining in the coalfields to the NASCAR-Talladega Speedway to "rabbit holes" in Affrilachia where "the rainbow ends," with the masterful ease of Appalachia's future poet laureate. 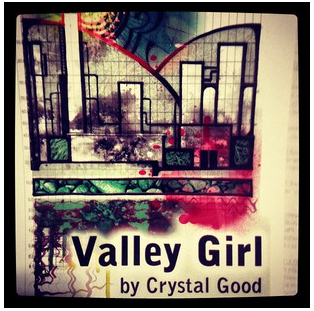 Valley Girl is a beguiling read, at once bold, disarming, plucky and feisty, unabashed in its spoken word hip hop dares and verbal "pivot," and deliberate in its narrative storyteller verve; it wonderfully carries on the legacy of Good's fellow Affrilachian Poets, including the spellbinding work of recent National Book Award-winning poet Nikky Finney and Frank X. Walker. A self-described quantum Christian, tunk player and mother, Good effortlessly moves between places of her heart and a "single Mom / concession stand / working it," and defiantly challenges to the reader to ask the same questions that "got us all crazy." for the next industry. Damn didn't we get degrees? Coal miner's daughter is now chemical plant step kid. are brand new cars, money to spend on hotel rooms, Nike shoes. all we can do is stay -- shelter in place. always reminding them, they really not worth much."